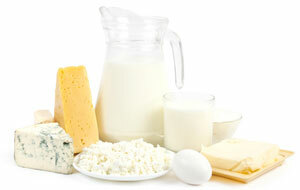 Calcium is a mineral found in many foods and in the body. In the body, calcium is known for building and maintaining strong bones and is mostly stored in bones and teeth. But calcium also impacts physiological activities, such as blood clotting, cell membrane function, muscle movement, carrying messages between body parts via nerves, and regulation of enzyme activity. In order for the body to maintain these physiological activities, the body naturally regulates calcium in the blood. If dietary intake of calcium is too low the body will draw on calcium stored in bones to maintain normal blood concentrations. One downside to this is, if calcium deficiencies take place in bones it may lead to osteoporosis—a disease of the bones in which bones become fragile. Calcium may play a role in the prevention and /or treatment of cataracts, colon cancer, high blood pressure, kidney stones, osteoporosis, and premenstrual syndrome just to name a few. Dietary calcium can be found in many foods. Collard greens, mustard greens, spinach and turnip greens are each excellent sources of calcium. Basil, cinnamon, cow’s milk, goat’s milk, kale, mozzarella cheese, oregano, Swiss chard, thyme and yogurt are very good sources of calcium. And Brussels sprouts, cabbage, celery, green beans, leeks, oranges, rosemary, scallops and summer squash are good sources of calcium.